Spaulding Lake in Clarence, NY is not that popular for photos to be done. You have to live in Spaulding Lake to actually even go there. Otherwise you are trespassing. Justin and Melissa wanted their engagement session done there. Justin's father lived in Spaulding Lake, so he set it up for us! This image is really fun if you look closely. Melissa and Justin wanted super casual for this part of the shoot. They did basic jeans and white tees! We had them sit on a log by the water and get nice and close. Then we added some light to the front of them. They were blending in with the back ground and it was getting dark fast. Look in the back ground. You can see a bunch of people fishing on the dock. There were boy scouts camping at the Lake that night! How fun! We actually picked this spot for Justin and Melissa because we wanted the boys in the photo! 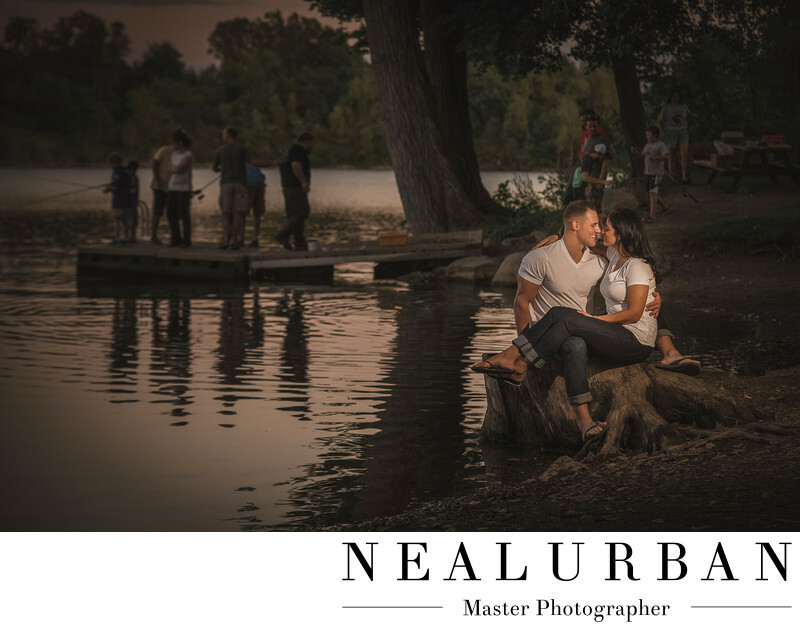 We loved how time stopped for this lovely couple, but not for the fishermen in the back! We never know what is going to happen on a photo shoot. You cannot always plan everything one hundred precent. The more planning, sometimes, the more complications and stress. Having some lulls can make some different ideas come to life, just like it did here! Location: 4805 Spaulding Dr, Clarence, NY 14031.